Updated 3/25/2013 After Nova has been blasted to the ground by the newly empowered Hikaru, she looks up, badly shaken, and sees the Knight extend a hand toward her. Fearing that she is about to be finished, she gazes back at her adversary with this panic-stricken expression. Nova's terrified eyes and drooping ears are well rendered by the artist. Notice that the cel has had its trace lines reinforced on the front in several places with a thin marker pen. At first, I thought a previous owner had done this to cover up line fading, but the pink paint does not seem to have faded the trace lines significantly in other places. Comparing the cel closely to the image in the screen cap, though, it's clear that this was done by the studio, before, not after, it went under the camera. 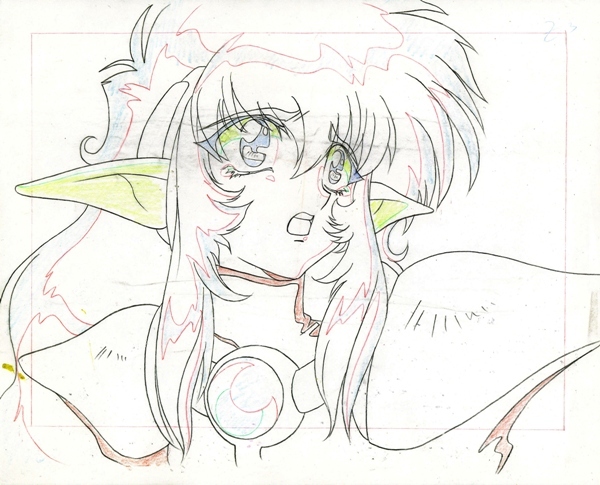 The douga (see thumbnail), as usual with this fine series, is also extraordinarily beautiful. 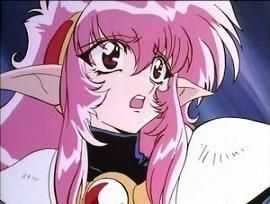 Aesthetics of Anime has a lovely frightened Nova from the end of a cut just before this one.